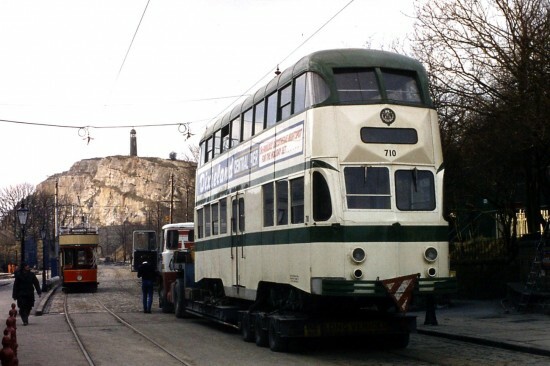 Today Picture in Time goes back over 30 years to a time when Blackpool Balloon 710 was on loan at Crich as part of the tram swaps for the Centenary of tramway which saw a number of cars from the national collection head over to the Lancashire coast. 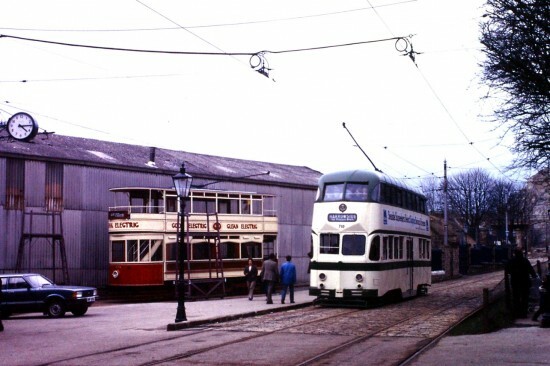 Two trams were sent to Crich in part exchange for those trams from Derbyshire which were playing a major role in the Centenary celebrations – Boat 607 and Balloon 710. The Balloon Car – one of three of the class to have been at Crich over the years, interestingly numerically following with 711 and 712 the others – was transported across to Crich in early April 1984 and, still with Blackpool adverts in place, was used extensively in Derbyshire over the next two seasons. It finally headed back to the northwest in December 1985 and the remained in service on its home tramway until withdrawal in 2007. Now part of the Fleetwood Heritage Leisure Trust collection the tram can be found in store at Wyre Dock. In this first photo we see 710 being delivered to Crich in April 1984. Note how different the lorry used back in the 1980s was and also the lack of fence separating the main running line and depot yard. Paisley 68 looks on. Into 1985 and we see 710 in action heading north past the depot with a service apparently for Harrowside! Alongside the depot can be seen Blackpool Standard 40 with the finishing touches of its overhaul being completed before it went off to Blackpool to be the poster star of the Centenary events. This entry was posted in Blackpool Tramway, Crich Tramway Village, Picture in Time. Bookmark the permalink.